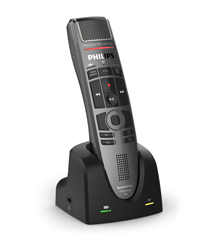 For the Speech Recognition user preferring a hand-held microphone with programmable buttons, Philips has created a beautifully engineered wireless product - the "SpeechMike Premium Air". While very similar in look and feel to to the SpeechMike Premium Touch, this product utilizes a lossless wireless connection and docking station for charging and pairing. The result: flawless performance, lots of options with the programmable buttons, and no tethering with a cord.